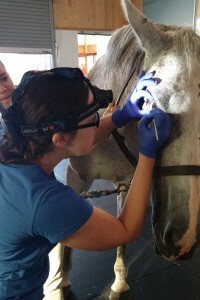 Management of infectious, immune mediated, and traumatic conditions of the equine eye is a frequent task of our ambulatory veterinarians. Installation of subpalpebral catheters for administration of medications, diagnostic and therapeutic corneal debridement, and surgical treatment of traumatic injuries and tumors is not uncommon. Sometimes hospitalization for intense treatment around the clock is necessary to speed healing and limit loss of vision. Our surgeons are experienced in ocular surgery for those cases requiring a surgical resolution of their condition. Visiting board certified ophthalmologist are available for consultations.